A brain injury can happen to anyone, anyplace, any time. According to the Centers for Disease Control and Prevention (CDC) each year, at least 2.5 million children and adults in the United States will sustain a traumatic brain injury (TBI). Brain injury survivors may encounter difficulties with emotions, behavior, and cognitive functioning. Although victims may appear normal, they may be suffering from invisible injuries resulting from their brain injury and causing them to exhibit emotional, behavioral, and cognitive problems. They may not be able to control their thoughts, emotions, or reactions. They may be quick-tempered, impulsive, and aggressive. With this in mind, and to help avoid misunderstandings with police, EMT and ambulance personnel, and others, this complimentary, customized, brain injury wallet identification card has been created. 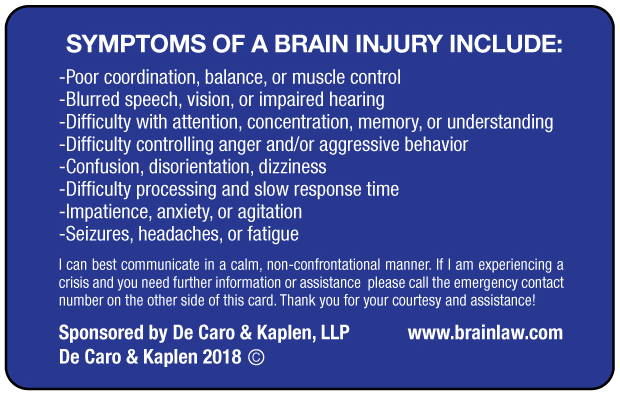 This card is provided free by the brain injury law firm®, De Caro & Kaplen, LLP to any brain injury survivor. It is designed to help police, emergency personnel, and others more easily identify brain injury survivors, and insure that they are treated appropriately, and provided support as needed. * We do not collect, distribute, disseminate, or sell information, which is solely used for the production of the card. 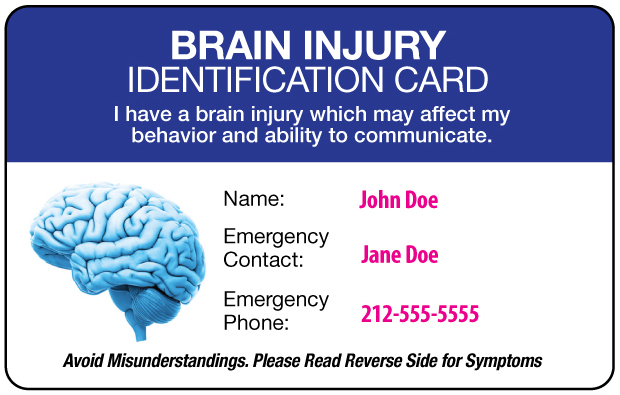 This card is available to anyone who has sustained a brain injury. The only information that an applicant must provide is his or her name, emergency contact name and telephone number. The customized card will be mailed directly to the applicant. To receive a personalized brain injury identification car, complete the information on the right. Motor vehicle crashes, including truck and bus collisions, pedestrians struck by motor vehicles, motorcycle collisions, falls, sporting accidents, construction site accidents, medical malpractice, and assaults are leading causes of traumatic brain injury. 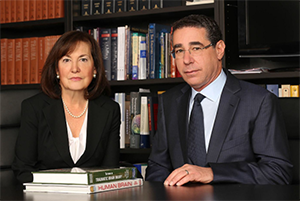 De Caro & Kaplen, LLP is a New York based law firm focusing its practice on representing brain injury survivors. Shana De Caro is the secretary of the executive board of the Brain Injury Association of America. 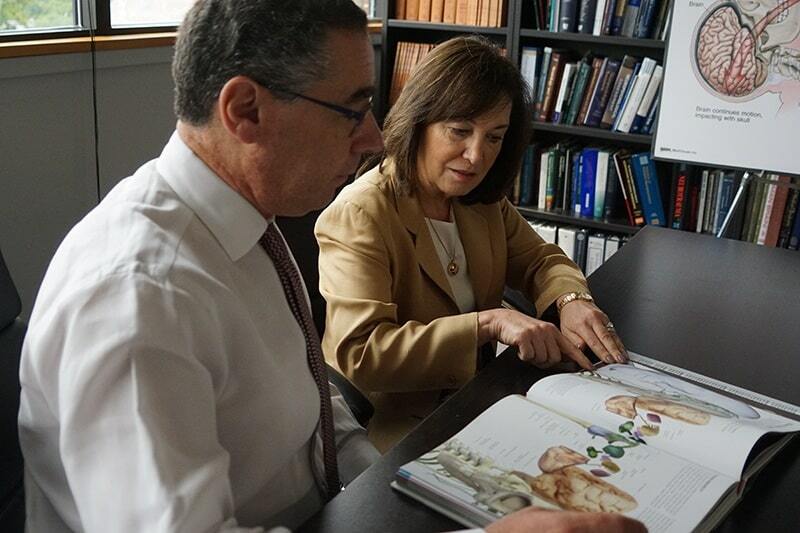 Michael V. Kaplen is the past president of the Brain Injury Association of New York State. The law firm of De Caro & Kaplen, LLP are recognized as preferred attorneys by the Brain Injury Association of America. They are the only law firm in the United States whose partners have both chaired the traumatic brain injury litigation group of the American Association for Justice. Michael V. Kaplen is a Professorial Lecturer at the George Washington University Law School teaching the only course on traumatic brain injury law in the nation. Shana De Caro was lead attorney for the Brain Injury Association of America challenging the NFL class action brain injury settlement on behalf of injured football players before the United States Supreme Court.